This conference is designated for Community Corrections Chiefs/Directors across the State of Texas, their executive level team, and/or whom they deem appropriate for leadership exposure. APPA's Resource Expo is the only exposition dedicated solely to the needs of community corrections. At the Resource Expo, you will discover the latest products, innovative services and state of the art technologies to meet the challenges of keeping our communities safe. You can see, test and compare products and services while discussing your agency's specific needs with experts in areas such as correction software applications, drug testing technologies, offender monitoring systems, training and curriculum development, substance abuse and behavioral health programs and many more valuable products and services. Nothing rivals this resource of product and service information! The 46th Annual Conference will kick off August 20th at the newly renovated Little Rock Marriott Hotel (formerly The Peabody) and Statehouse Convention Center. This year’s theme “Great Counties Under Construction” celebrates the continued process of great county government as well as the new construction and renovation to the AAC Headquarters. Join us for an informative meeting sure to be beneficial to everyone! Financial Intel and Justice Solutions are excited to be attending this conference. Arkansas Collector's Conference. Taking place on December 4-5 in Hot Springs. Headquarters: Renaissance Austin Hotel, 9721 Arboretum Blvd., 512-343-2626. For more information, contact the Texas Association of Counties Legislative Department at 800-456-5974. Local Government Solutions and Financial Intel are excited to attend this conference. 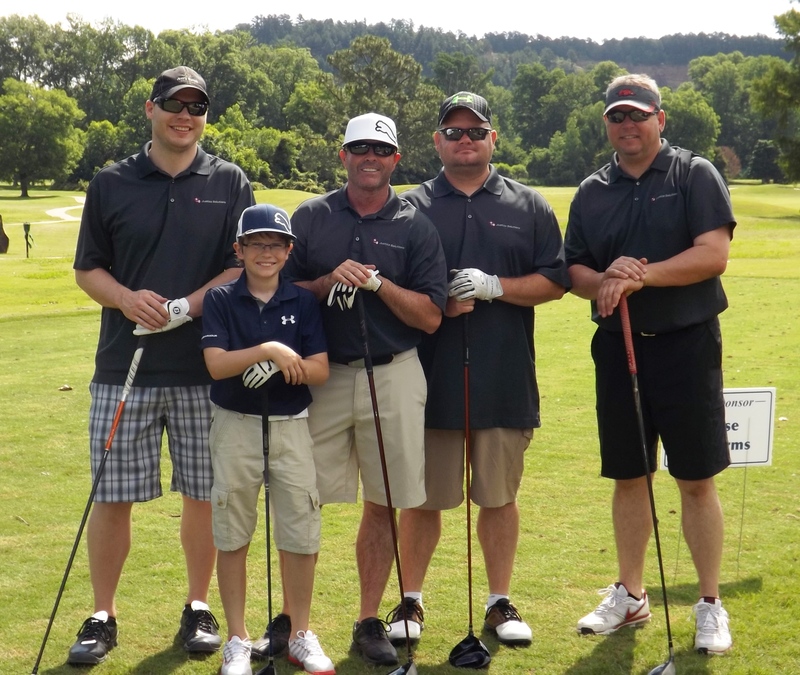 Company members from Justice Solutions participated in a Memorial Golf Tournament to help raise funds for fallen Detective Keith Spangler. On Friday, January 14, 2000, Little Rock Police Officer Byron Keith Spangler died in a plane crash in Carlisle, Arkansas. Keith was 31 years old and a detective for the departments burglary squad. Native of Poteau, Oklahoma, he was a police officer with Little Rock since 1994. Keith was pursuing a private pilots license when the terrible accident occurred. He is survived by his wife, Lia Spangler, and two sons, Corey and Brennen. Keith did not have extra life insurance, and the department's insurance policy will not cover him because he was in a private plane. In order to assist Keith's family, a trust fund has been set up in his name. Property owners in Sebastian County are among the first in the state who can pay their personal property taxes online, as well as receive electronic statements and receipts, according to Sebastian County Treasurer-Collector Judith Miller. Miller said the county’s new online system is part of a tax collector software package the county purchased in January for $46,000 from Little Rock-based TaxPro to coincide with new state laws that mandate bookkeeping. 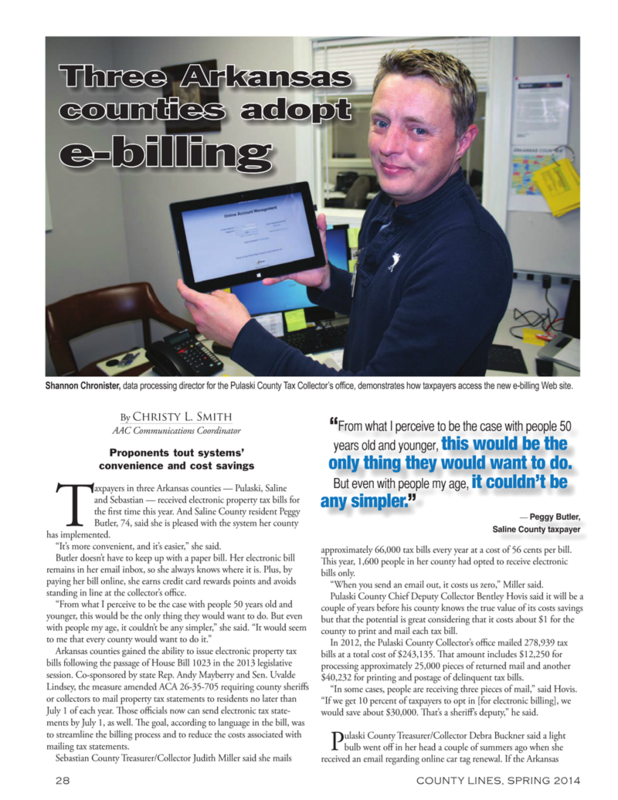 Pulaski and Saline counties use the same software package. Miller said the change in the state law to allow counties to send out electronic statements will allow property owners to get information in a timely manner. Bentley Hovis, chief deputy at the Pulaski County Treasurer-Collector’s Office, viewed the move as a long-term savings venture for Pulaski County. Hovis said the county sends out more than 300,000 tax bills annually, which he estimates costs about a dollar per statement. According to Miller, her office spends 56 cents for each statement mailed to the county’s property owners. The cost includes envelopes, postage and printing. Miller said about 1,600 property owners have opted in, which she said is a savings to the county. 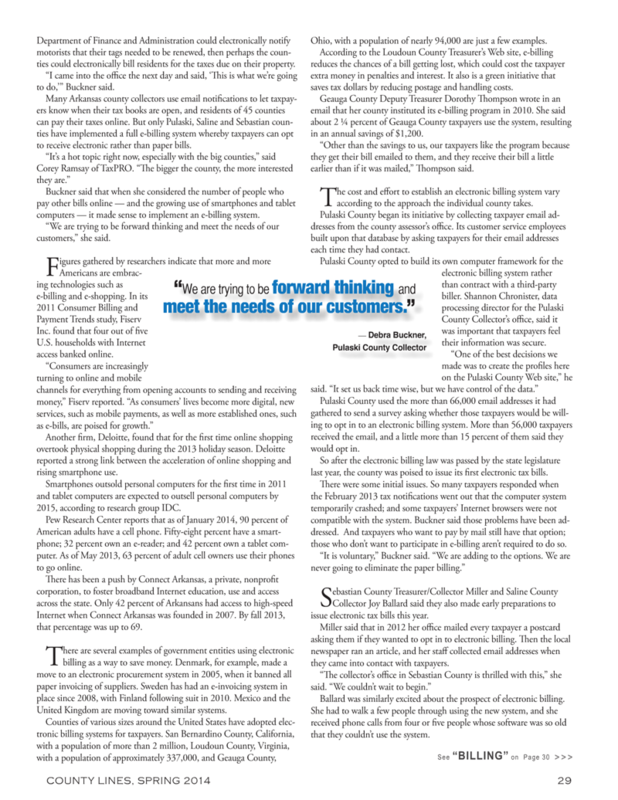 Though the number appears small, Miller said the program is in its infant stages and anticipates the number to grow much larger, leading to more savings for the county. Miller said the collector’s office has 57,884 real estate owners and 55,813 personal property owners on the books, many of whom are duplicate owners. She said she’d like to see at least 32,000 property owners opt-in for the service, which would save the county an estimated $17,920. County Judge David Hudson said the cost-saving measure is a good move for the county. The tax books officially opened March 1. The deadline to pay property taxes is Oct. 15. TaxPRO is excited to announce that we offer the ability to certify to the State Land Commission electronically! 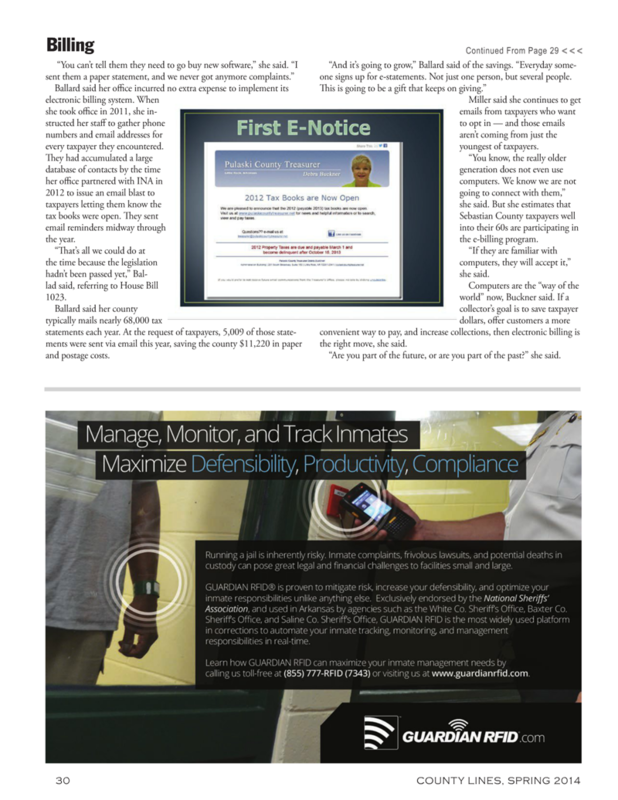 For more information about this feature please contact TaxPRO at 501-246-8060. Texas College of Probate Judges or TCPJ is a private, non-profit educational organization composed of Probate Court judges, and their staffs, from throughout Texas. TCPJ seminars offer probate court personnel an opportunity for continuing education as well as an opportunity to meet and talk about issues involving probate, guardianship, and mental-health law. TEXAS CORRECTIONS ASSOCIATIONis dedicated to providing a forum for promoting quality correctional practices through professional growth, leadership, mentorship and education. TCA is organized to anticipate and respond to the needs of our members, clients and the general public. Building the public awareness, recognition, knowledge and support for the corrections professional and the corrections field. Promoting ethical practices and a code of ethics for the benefit of the corrections professional and the general public. Creating a strong environment of education and information through conferences, training, communications and website. Protecting our communities through education and development of citizen support for prevention, control and treatment of crime and delinquency.